I have been knitting — in fact I have a few finished projects and two just-about-finished projects! 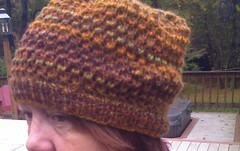 Here is one of the finished to share — it is the slouched tuva hat knit with my very own handspun! and a link for all you ravelers! I think I will add an increase after the ribbing on the next one I knit for an even slouchier effect. Wow! That fire really is huge!! Nice knitting there, you. Love the colors in your handspun! So cool that you knit the hat with your own handspun! It’s lovely. The golf club covers look great, too. I’m glad D#1 is & her friends are okay — it’s kind of scary, even with it not being her home. It’s so nice to see your own personal resurgence in bloghood! Thank God no one was killed or injured in that fire. SCARY! Lovely hat! Knitting with your own handspun rocks! Annie love the handspun hat, the colors are so beautiful. and the golf clubs so funny, well done, and useful. Guys gonna appreciate your efforts. Great to see you yesterday looking forward to this a.m. yoga.